Hey guys, Matthew Weiss here — theproaudiofiles.com, mixthru.co, and I got to give a special shout out over to producelikeapro.com. That’s my good friend Warren Huart’s site. He’s got some amazing educational content over there, and that’s where the multi-tracks for this little tutorial came from. I really encourage you to go over to that site, and download these multi-tracks, because they’re great, they’re really high quality, and you can learn a lot from them. Anyway, let’s get into this. 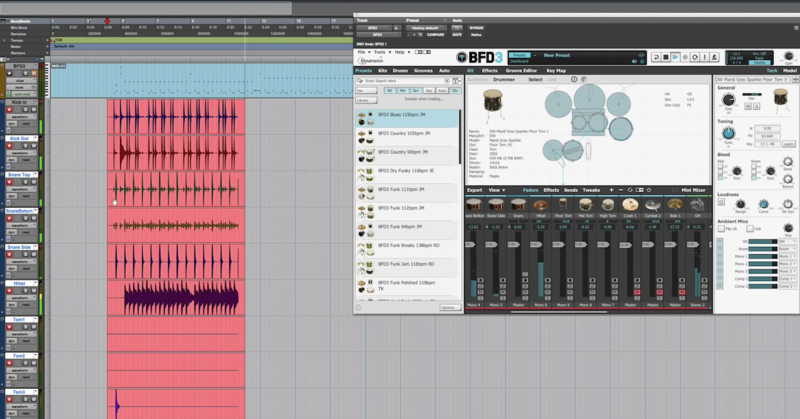 We’re talking about compression on the drum buss. First of all, let’s start by playing this drum loop, just so we know where we’re at. So it sounds pretty good, I mean, it’s well played. It’s been treated by yours truly a little bit, so it sounds pretty nice. So if we’re going to do some compression on the drum kit, we really have to start with the most fundamental question in the world, which is why? Why are we going to do this? Because if you’ve followed any of my tutorials, if you’ve listened to anything I’ve said, one thing I repeatedly say is we don’t do stuff just for the sake of doing it. We figure out why we want to do it, and we go from there. So, why might we use compression on drum buss? Well, one reason, and probably the most common reason, is to thicken the sound. That means that we’re going to create a limited dynamic range so that all of the quiet stuff comes up, and that means the tails of the different drum notes, all of the room tones, some of the bleed between the different microphones, all of that stuff is going to become louder and more present, and what that’s going to do is create a thicker sound. It’s also going to create a more cohesive sound, and sometimes we call that glue. So we might use this for thickness, we might use this for glue, they’re kind of one and the same. That’s one reason why we might do it. Now, this drum loop, it sounds good. It sounds like it’s got a sort of nice, open vibe. I wouldn’t want to totally lose that, but I do think it could be a little bit thicker. So that’s one reason why we might grab some compression. What’s another reason we might grab some compression? Well, we might do it for the tone of the compressor. Maybe we want something that gives a little bit of gloss to the high end. Makes the hi-hats a little shimmery-er. 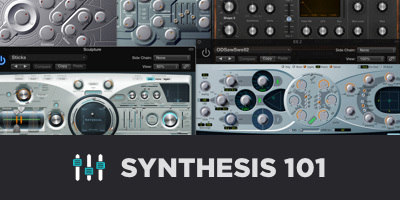 Maybe we want something that kind of pushes the upper-mids, gives a little more bite to the snare, or maybe we want to mess around with the sidechain filter, and create a compressor that ends up bringing up the low end information, and gets some more weight into the kick. Those are all things that could be conceivable reasons for grabbing a compressor. I’m not going to lie, I wouldn’t mind if the kick was a little bit weightier, and there was a little more bite in the snare, and if there was a little bit more shine in the hi-hats. Maybe we can grab a compressor that has some tonality to it where we can get all of those things? Now, a third reason, and a very common reason why I use compression on the drum buss, is to bring out the inside groove. In this particular case, the inside groove is that hi-hat line. Not only can we bring it out, but we can bring it out in deliberate ways — by really adjusting those attack constants and release constants, we can create a little bit of an arc for anything that’s like, a ghost note, or an inside groove type of thing. So maybe we can give this a little bit of an eighth note swing to it. Bring out some accent onto those eighth notes, and give it this push/pull kind of dance motion. So those are three really good reasons why we might be using compression, and in this particular case, I want all three of those. So here’s our before, followed by our after. Pretty cool, right? It’s like the whole kit becomes closer to us. There’s a little bit more groove, there’s a nice tone that shows up, a lot of cool things are happening from this compression, and at the same time, we’re not losing any of the original sound, really, we’re just making it better. So, okay, let’s pop under the hood here and look at what’s going on. So when setting the compression on drum buss, the most important controls, in my mind, are the attack and the release. The attack is going to determine how much the compressor really clamps down, and how much of the punch ends up getting lost. I almost always tend to default towards faster — or, I’m sorry, towards slower attack times. The slower attack times allow the leading edge of the kick and the snare to pop on through, without really getting attenuated. Now, you can see here that I’ve got the attack set pretty darn slow. Still, we’re going to lose a little bit of the leading edge of the snare. Listen. It’s not quite, quite as punchy. We haven’t lost a lot, but this is just sort of the nature of the beast. Whenever we’re compressing, we’re by default — or just inherently, by the nature of it, reducing some attack, because that’s how compression works. Now, what’s more important, in my mind, is the recovery time, or the release time. This is the sweet spot here. Listen to the hi-hats, before and after. You feel how that eighth note ride starts to really, like, — well, I shouldn’t say ride, but that eighth note bounce starts to really come to life with this compression? Watch what happens when I start tweaking these recovery times here. We bring out the hi-hat. It becomes louder, but it doesn’t really change the pulse of it. It doesn’t really create that groove that I’m looking for. That eighth note accentuation. That off beat bounce starts to come to life and really pop out, and that’s what I’m going for here. Now, this is going to change depending on the tempo, the actual drum groove, sometimes you’re going to want a slower recovery time, sometimes, you’re going to want a faster recovery time. The question is, what kind of groove do I want? What kind of arc do I want to hear, and if we ask ourselves that question, and then we just tweak it until we find it, then we know what we’re going for, and we know what we’re trying to bring to life. A couple other things that are cool about this compressor, listen to the overall sound — like, the top end and the upper-mid range. You hear that gloss start to show up that’s maybe like — it’s like a harmonic glossiness from like, maybe 3kHz on up. The hats become a little shinier, and it’s because there’s some distortion built into this. There’s a little saturation built into this particular compressor that I really like the sound of. So it’s not an accident that I’m using this particular compressor. This Klanghelm actually has two other modules in it, and they both have different tones. I’m picking the one that has the tone that’s right for these drums in my opinion. 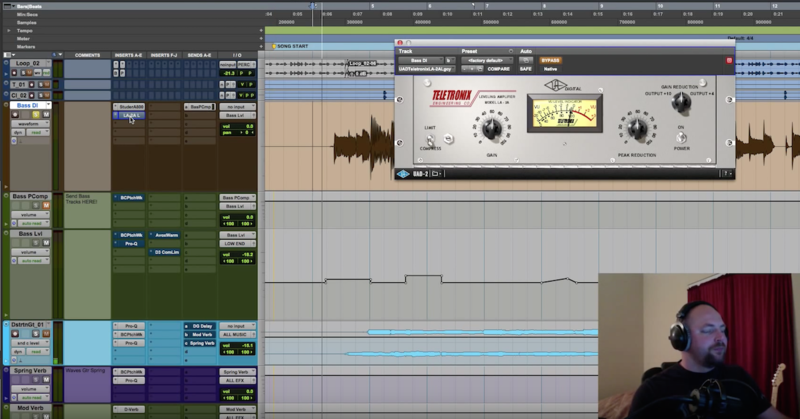 Now, this — if you go on to Produce Like a Pro, and you check out Warren’s breakdown of this exact same thing, yep, you’ve got another really incredible engineer who’s working on this exact same recording showing what he’s doing. 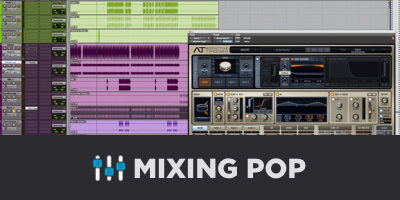 He also used one of my favorite plugins, the MV2. This is sort of like a parallel limiter, and it’s really great for thickening up the sound. So, this MV2 plugin is really cool. It’s got these two different settings. One’s called low level, one’s called high level. The high level one functions kind of like a normal limiter. The low level one is like a parallel limiter, which has this really cool tone, and this really great way of thickening things up. I almost use it as, like, a finishing touch, like, last move type of thing, and so if you watch Warren’s video on these drums, he pumps this thing. I’m not that cool, I use it pretty subtly, it doesn’t make a huge difference, but it’s still pretty darn noticeable, and pretty awesome. So let’s do the before and after really quick. It just makes everything a lot thicker. We hear a little bit more of the tail of the snare, tail of the kick, we hear a lot more of the sustain, and there’s a certain upper-mid range, or just broadband mid range color that’s coming into the record that — it feels a touch grainy, maybe? But since it’s drums and usually I kind of like that little bit of aggression, it works out really well. So one more time, before and after. Pretty cool. So that’s why we might use compression, and also how.